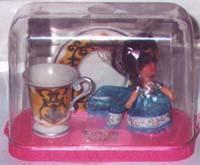 Tea Party Kiddles Dolls 1970-1971 - there are four Mattel Tea Party Kiddles dolls (all Stock #3840) - 3 1/2" tall, each set has a different designed tea set; doll, cup and saucer. Playhouse Kiddles Dolls 1970 - Mattel Playhouse Kiddles (three dolls) are 3 1/2" tall, all sold only in 1970. 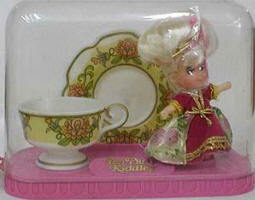 These were the last of the larger Kiddle's, they each came in their own room setting; Cookin in a kitchen, Pretty in a parlor and Good Night in a bedroom. Liddle Baby Kiddles Dolls 1970 - Liddle Baby Kiddle dolls, a total of four dolls - 2 1/2" tall, dolls marked C. Mattel Inc. Taiwan, accessories marked 1969 Mattel Inc.
Blonde rooted bangs, blue painted eyes, closed mouth, dressed in gown and cap, came in a pink plastic bunny bassinette. 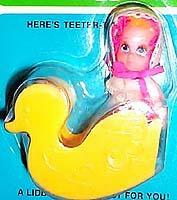 Orange rooted bangs, blue eyes, closed mouth, dressed in white gown and bonnet, came in a yellow plastic duck shaped teeter todder. Blonde rooted bangs, blue painted eyes, closed mouth, dressed in yellow and lace gown & bonnet, came in a blue plastic bunny high chair. 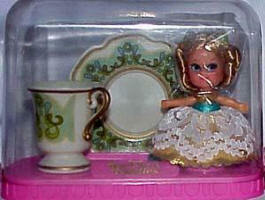 Black rooted bangs, brown eyes, black doll, closed mouth, dressed in pink striped gown and cap, came in a pale green plastic bunny bassinette. After the Playhouse Kiddles and Little Baby dolls the Lucky Lockets were re-issued in 1976-1978. In 1979 Mattel re-introduced the Kiddles as Sweet Treats with Sundaes, Ice Cream bars, Spoonfuls and Cookies, these dolls are much smaller at 2-2 1/2" tall. 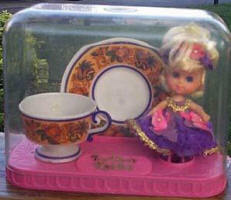 Tyco in the 1990's sold a Kiddle like doll they are called; Strap-on's, clip-on's, Lovely Lockets and Pretty Perfumes.